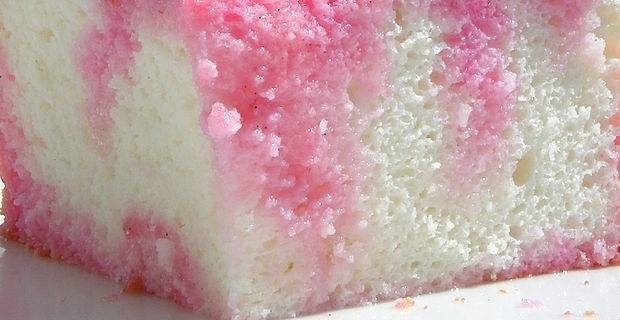 Angel Food cake, or Angel cake, is a type of sponge cake originated in the United States in the late 19th century. Famous for its airy lightness, it was also often addressed as being food fit for angels, hence the name. Enjoy home made Angel Food cake with our easy recipe. An Angel Food cake takes 50-55 to prepare with this easy recipe. Preheat the oven at 175 -180 degrees. Sift half of the sugar with the salt in the flour and set aside the remaining sugar. Place the egg whites, orange essence, cream of tartar and water in a large bowl and start whisking by hand until they are combined. After a couple of minutes, switch to a hand held mixer. Add the remaining sugar, slowly, while keeping beating at high speed. When medium peaks start arising, it's time to sift in the flour. This, again, must be done slowly, step ny step, making sure you only add flour enough to just powder the top of the foam, then fold in gently using a spatula. Repeat this step until all the flour is combined in the mix. Use a tube cake pan, without greasing it. Spoon in the mixture carefully, then bake for 35-40 minute. As usual, you may check if the cake is ready any earlier by piercing it with a wooden skrewer and see it it comes out dry. Once cooked, make sure you cool the cake upside down on a cooling rack before getting it out of the pan. This lightly sponge cake is delicious on its own, but it can be easily modified to suit any cravings. For instance, you may want to try a Orange Angel Food cake version: simply add 2 tablespoons grated orange peel and 1 teaspoon orange extract into the batter. Or perhaps you would love the Ice Cream version: simply cut your Angel Food cake horizontally into 3 layers, then spread each layer with softened ice cream. Reassemble the cake, then freeze. Ready to serve, simply.